Hibs fans have been named the country’s top travelling supporters, knocking Aberdeen off top spot. Hearts fans were named as runners-up with the Dons coming third in the Scottish Football Supporters Association’s Fans Awards. Tynecastle, though, has been named the ground most away supporters like to visit for the third year in a row. Kilmarnock boss Stevie Clarke was named manager of the year with Ayr United’s Ian McCall in second place. ‘Goal of the Year’ went to James Forrest for his fantastic second strike against Albania in Scotland’s’ 4-0 victory in Shkoder. Adam Hammill’s incredible goal for St Mirren from inside his own half in a 2-2 draw with Hibs was voted as the second best. Scotland’s ‘Best Ref’ was Craig Thomson, who beat John Beaton and Steven McLean to the title. 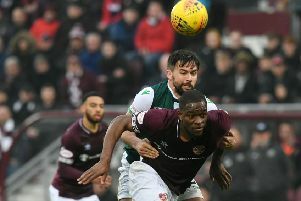 Former Hearts and Hibs midfielder Michael Stewart was again voted the fans’ favourite TV/radio pundit keeping Chris Sutton in second spot.